* I knew that guy. We’d been in high school together. He graduated a year ahead of me and did what I had been talking about doing myself– leave Seattle and go to the southern tip of South America by motorcycle. He left with two other friends and got as far as Panama on their motorcycles and that is where the Panamerican Highway ended (and still does). The other two went to the Caribbean and he began to hitchhike south. 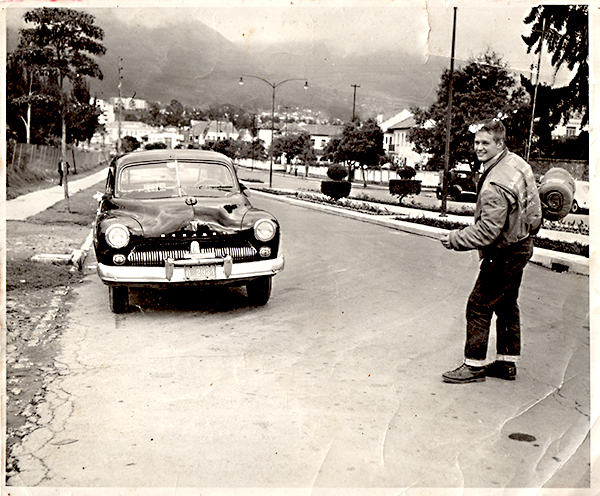 * This picture was probably taken in Quito, Ecuador (license plate of the Taxi attests to that) and written on the back of this 8×10 Black and White photo is the salutation, “Thank you for your help on my trip around the world, Seattle, Washington 4/3/61.” The fact that the photo was taken in Quito,Ecuador and wound up in a garbage dump on the beach in Mazatlan and came into my possession is truly a small world wonder. Now I’m wondering… Is there really a garbage dump on the beach in Mazatlan? Why would they put a garbage dump on a beach? this could also be a top contender for the “hottest guys of Found” competition.